Throughout history times of prosperity have always been times of fair government, education of the masses and freedom for the people to pursue their interests. This is exemplified by the ancient Greek and Roman civilizations, the Renaissance, and the USA up until the ‘60’s. Periods of darkness tend to be characterized by corrupt rulers, fanatic religion, and decimation of the people for the purpose of conformity. The subject of this essay is the interconnectedness of Darwinism and religion. Contrary to popular thinking that Darwin negates the ideas of religion, they are rather two sides of the same coin. In Darwinian thinking evolution is based on genetic improvement through the needs of survival. Every change is somehow motivated and supported by this one principle. It is a cold view, one which encourages competition, selfishness, greed, cruelty and lack of compassion. It pits people against each other to vie for resources, for jobs, for recognition; to hoard, to amass material wealth. Men who would otherwise never attract a woman now have the means to buy them. It supports the economic helplessness of women throughout history. Perhaps that is the real reason men are so afraid of female independence – if women didn’t need them economically maybe we would never put up with them. It encourages winning at all costs regardless of consequence, of morality. The destruction of nature. The pillaging of the earth. It supports the idea that people are evil and need a god to dole out vengeance and punishment, a stern but (occasionally) fair father figure. The lack of justice creates a feeling of need for ‘divine intervention’. It encourages helplessness and the subsequent need for a ‘savior’. Religion thus offers the ‘solution’ to these human ills. It offers solace, refuge, it speaks of the ‘oneness’ of humanity and counsels against selfishness and calls for the ultimate destruction of ‘evil’ - mankind. Apocalyptic thinking. Messianic thinking. And ironically, the way they gained so much power was by killing everyone who didn’t agree with them. Kind of like the Nazis did. Exactly like the Nazis did. While Darwin focuses on the animal, mechanical side of humanity religion focuses on both the capacity for higher consciousness and the most primitive, superstitious, side. Together, both of these approaches to life yield an imbalanced self-destructive society. Cults that believe that the only way to be rid of the ‘evil’ within is to impose physical and emotional suffering on themselves. It encourages ignorance. They are both based on a patriarchal social structure of brutality and physical strength and oppressing and devaluing the feminine principle of openness, creativity and emotional strength. The further oppression and demonization of women, i.e. the witch hunts and the burning of ‘witches’ – more often than not just women who were not docile and passive to every demand or those who had knowledge of how to use nature to heal. Or indeed, to influence. Why are men so afraid of women? Our patriarchal society now includes doctors who control our health through drugs promoted by companies for whom profit is the only motivation. A mechanical cut and paste mentality. Drugs which cause more harm than good, which have taken the place of ancient systems of natural medicine using herbs, color, touch, music, a knowledge of the body’s energy flow to heal. Systems like Chinese medicine that has been around of for thousands of years is now called ‘alternative’ or discounted as ‘spiritual bunk’. A system that views the body, emotions and mind as a whole and understands the interaction between the two. Instead we have surgery to dissect our bodies and psychology to dissect our minds - analysis seeks to neutralize our deepest desires, needs and individual goals for our lives. It deconstructs us and creates insecurity, imbalance, dependence, and helplessness. Again, very patriarchal and oppressive. Like religion, defining women solely by their reproductive function and accusing them of trying to be like men or hating men if they are capable of or want more. Those seeking salvation with a more scientific bent turn to psychology, those with a spiritual bent turn to religion, but either way the result is the same – a population that is steeped in unproductive thinking. Darwinism proposes a mechanism for survival, but in fact the opposite is necessary for survival – cooperation. In all primitive societies cooperation is the most aspect for survival. Hunters went in groups. People gathered together in towns to interact and exchange to satisfy the needs of life as well as protecting each other from the danger of wildlife and other people. Problem now being that the philosophies that embody cooperation – spiritual ‘oneness’, communism, the needs of the many outweighing the needs of the few, ends up promoting uniformity, conformity and the loss of originality which is the most important role for the advancement of society. These societies i.e. France and Germany constantly disempower their populations by interpersonal attacks, by the constant arguing that wastes time and energy so that people can’t concentrate on what they need to do, by taking away their right to choose for themselves, beginning with the premise that people are stupid, limiting what can be acquired and their self-confidence. France and Germany, two sides of the same coin – the one technical and aggressive, masculine, the other creative and chaotic, feminine. Shouldn’t really be surprising that they are now joining forces, after all, the Franks who settled France were a Germanic tribe. A true community is a group of like-minded individuals, working together towards a common goal but counting on a division of labor and different contributions, different skills, to achieve that goal. Without uniqueness or individuality we are mere bees in a hive – cooperation, but ultimately our only function is the feeding of the queen, our lives have no real value. Born serve die. Life is to be endured, not enjoyed. And if we’re good and obedient we get to go to heaven afterwards. 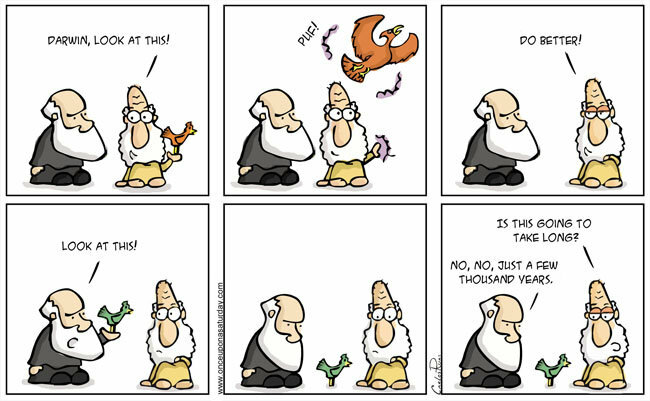 It’s a perfect symbiosis really, religion and Darwin. In an ironic turn, this idealistic spirituality – oneness - is being twisted by those in power to use people’s need for enlightenment and peace to perpetuate their position. They counsel yielding to a higher power so that no one will challenge them. This is why religion has always been about tyranny. They rule through fear. They counsel against the ‘sin’ of individuality. Ultimately the group, which then make decisions for the individual and decides who each person should be or do, robs that person of their own basic intrinsic right to self-determination, which is what distinguishes freedom from slavery. All those who are free decide their own fate. Those whose fate is decided for them are slaves. People who guide their lives toward fulfilling potential are happier, have a greater sense of well-being, energy and ability to love. This person cannot be enslaved. They are now being attacked by religion. As I suppose they have always been. Even those spiritualities that propose meditation and higher states of consciousness are based on self-hate and a negation of life. How much living are you doing when you are sitting for hours with your eyes closed? How different is that practically from people who exit life through drugs? Manifestation is the key and purpose to living. To explore the mind and manifest. To fulfil potential. Bring all that beauty into the world. A true well-functioning society would be like a body, with specialized cells that perform unique functions that are all equally valuable and essential. On whatever level their function is. Brain or toenail. Differentiation being the key. This is true equality and with it comes respect for every part of the whole. Our society wants sameness so that there is a master and slave system. Because of this those who fulfil a less glamorous function are treated with disdain. Both Darwinian economics and the religious system want the same thing. The beehive. The anthill. Like New York. All these people in black rushing off to work, pouring into subways like ants in and out of the hill. They want cogs in a wheel. They don’t want anyone to think for themselves, they don’t want free will, they don’t want individuality. They disdain the heart. They think people who feel compassion are stupid. So my question is, how long can a body survive without a heart? Not long. The ancient Egyptians believed that the heart was the most necessary organ, and not just physically – it was the heart that held the essence, the intelligence and the emotions of a person; all other organs, including the brain, were expendable. With all the marvels of our technology why are we so far behind in understanding who we are? Nature, of which we are a part, is magnificent in its variety and forms. It is gorgeous. And honestly, given the sheer variety I strongly doubt it is merely a function of Darwinian need for survival; rather it is the pure joy and genius of invention. Like Mozart, variations on a theme. Not need, just exploring all possibilities. The limitless unfolding of life. Every human being has a mix of everything that has come before us in unique combinations, making us possibly more varied than any other life form. And yet here we are trying to be the same. What a waste. The fact is that all human suffering comes from being separated from our true purpose and function in life. The inability to manifest truth and live out who we really are is what causes depression and all manner of illnesses. Living separated from nature in cities and working jobs we have no talent for or interest in, entrenched in an economic system that has no concern for us any more than the queen bee cares about the workers. As if an economy can exist in the long run based on that kind of incompetence. People criticize capitalism as if it were the evil. It’s not. In fact in its ideal form it is the only possibility for the individual to manifest. Entrepreneurship encourages personal growth. Encourages advancement in all areas of the economy by giving people a chance to do something useful and important to them. That is why America was so successful and it is now failing. Communism eradicates the individual. It’s a ‘one of us’ mentality. The only criteria is agreeing. Merit is not a factor. In Germany, which has a very ordered society, the sacrifice is that every person over the age of 35 is either mentally or physically ill. And yet this mentality is invading every aspect of so-called free society. Lack of ambition, low-minded popular entertainment, ennobling of criminality, degrading interpersonal interactions, bullying, religious doctrine insisting on ‘humility’ turning us all into emotional beggars. The subjugation of the individual. The misused principle of restriction to enforce deprivation. The need to keep people in a state of ignorance so that they will not challenge authority. The perversion and exploitation of the human need for higher consciousness to keep them enslaved. And again, the narrow-mindedness of patriarchal thinking. Again, why are men so afraid of women? In every other culture outside the Judeo-Christian-Islamic tradition there were female deities. The ‘sacred’ feminine was a recognized and respected principle. Our tradition demonizes women from the very beginning with the Adam and Eve creation myth and continues through Freud. Religion and Darwin. What if instead of this barbaric oppressive system we had one based on respect and freedom, knowledge and cooperation.